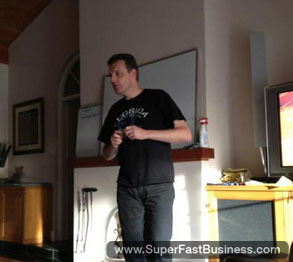 A few months ago I recorded some highlights from the first SilverCircle business mastermind intensive workshop. This month I invite my friend and participant Steve Ovens back to discuss the highlights from the second workshop. James Schramko here, and I’ve just conducted another one-day workshop at my house, which was SilverCircle intensive number 2. One of my guests was my friend Steve Ovens. Welcome back Steve. Steve: Thanks James! Great to be here, and great to be there yesterday. James: It was good fun. So what we’re going to do on this podcast episode is we’re just going to talk about some of the concepts that were covered in our one-day workshop. The cool thing is we had a couple of different sessions on different topics. I just want to sort of go through the highlights and ask you as a participant, what sort of things stood out for you, and I’ll also mention anything that I think stands out. So let’s get cracking. James: Memberships. We were just talking about what happens when someone comes to the website and we deal with a squeeze page, and you were able to map out for our attendees a simple process. Perhaps you could just give us an idea of what sort of things would happen when someone comes to a squeeze page on a website from the back end perspective. So we’ve specifically tagged the link from the banner with a special Google trackable URL so that we know where they came from. And then using a shortener to make that easier to pass around. That’s extra secret source there. So we bring them to the squeeze page, which is where we capture their details. And then from the squeeze page, they go off to whichever mailing system we’ve got and they’ll double opt in. We take them to our sales video, and that’s where we start tracking the goals. You’re really big on tracking James. You’re actually very kind showing us inside your Analytics. You track, has somebody confirmed? So we track them on our email list. And then that’s our sale. Once they’ve confirmed they’re on our sales page, the next obvious goal that we want to track is, did they give this money? Did they buy a product? So we have separate tracking of the goal. From the sales page, they go through a shopping cart, they hit a buy button, go through PayPal, do all that sort of stuff, and then they landed back onto a Thank You page, and on that Thank You Page is our second goal. So we can say, well that person has not only signed up for our list but they’ve also bought the product. In fact, there’s another step in there when they buy the product. They actually move on to a buyers’ list in our email system. The actual goal that we track is did they confirm their opt in for being a buyer? It’s a very conservative tracking of conversions because we’re only really seeing people who have bought the product and confirmed their opt in with mail. So they’re a committed buyer. So it was really good. James: Exactly. I think one of the things that was most interesting, when we went into the back end system of one of my products, I’d put in a special trackable link for people who avoided the squeeze page and were about to leave the site, they got the exit pop, which I’m using OptimizePress, and it gives you the option to put a link where you want to send people, and the tip is to put a trackable link there to your sales video. So they don’t give you their details then but they do actually watch the sales video, and interestingly, quite a few people actually end up purchasing. James: So they weren’t prepared to give an email but they were prepared to hand over the money, which is cool. The other thing that we compared was some statistics on the percentage of conversions of people who went via the squeeze page versus the percentage of conversions of people who went directly to the sales video by way of an A/B split test, which means I sent half the traffic to each and interestingly, the difference was only around about 11 percent more sales when they go directly to the sales video. And you’ve got to keep in mind that I’ve actually got the email address from the people who went to the squeeze page. So there’s a good chance with a follow up campaign, sequential follow ups that one day, that will balance out, become neutral, or could even be the positive for the people who gave me their email address and maybe took longer to purchase. Steve: Actually, the other thing that really stood out for me when we were looking at those statistics, James, was you also had tracked where people were coming to you who were previous buyers of other products of yours. You had such a high conversion rate, and I think that it just underlines the importance of that lifetime value of a customer that you’re always talking about. Look after the customer first. That’s job number 1 because then when you’ve got other products that are relevant for them, they already know that the quality is good and the conversion is easy. James: Well you know, the conversion statistic was really high. Steve: It was ridiculous statistics. James: It was over 50 percent conversions from one of my previous products to my new product. So that’s a very high conversion. So that means that of the people who actually came to visit my new product when I told them about it via email, more than half of them made a purchase. We’re talking about a $99 price point. So it was just proof that your best investment of marketing and attention is certainly in your existing customers. The sub-point there is if you’re able to incorporate some kind of incentive, or coupon, or loyalty component with a deadline, then you’ll definitely increase your sales because you’re recognizing to those customers that they are the best customers and you look after them better than you do the public. You tell them about the product early. You give them an incentive or some sort of extra value mechanism, and you make sure there’s a time limit on it so that people know that it’s a good time to take action right now instead of just thinking about it. So moving on from that, we had a scenario where some people were putting a new product into the market that they thought was probably a fairly small market, but we did some expansion exercises to actually uncover what other potential markets. We actually went from one market to at least five markets that they could be talking to about their product. James: …or reasons why. Yup. I think the dogs are very passionate about that point. And then the third step was we talked about the medium. How are we actually going to approach these markets. I think the big revelation there was that it wasn’t necessarily going to be firstly, they weren’t necessarily going to be talking to the market they thought they were. Secondly, there was a lot more advantages or benefits of the products than what they’ve realized. And thirdly, the way they were going to communicate with the market is probably very different now than how they’d intended to do that. You’ve probably had this experience talking to other people James, where when you start to unpack the potential of what a product can do or even what’s in a product, people start to say, “Oh wow. I’ve actually got a lot more value here than I had thought.” Often we’re too close to our own things. James: Yeah. We don’t actually see the potential. There’s a few points here but some that I want to stress are (a) it’s really good to discuss your idea with other people; not negative people, not family members, not people who don’t really get what you do, but other people who are perhaps in this case, it’s a mastermind environment, but other people who might see the potential in your product, even beyond where you can see it and to have them explain to you why they believe that’s the case. That really helps you craft your story. In fact, one of the exercises that I make people do is tell me how did they find out about it, what was their discovery process. From that story, you end up with a whole bunch of assets like the sales copy. You can create content pieces around that story and then you can say, “Wow. That story could really fit in so many other potential markets.” It was really fun to watch that thing grow way, way bigger than where it started. Steve: I mean the other problem, or not problem, but the thing that usually they wanted to then investigate was how do they get traffic to this thing once they’ve completed, or at least this close to complete. I think going through that exercise actually helped to see that it’s not going to be about really AdWords and SEO necessarily. For this particular product, it opened up all of these partners that they could go to and associations that would make sense from the contact. James: Well that’s it. By opening up the message, like what are you actually talking about and who are you talking about it to, that helps you pick the right medium to actually go and approach people. So that could be very different to SEO and pay-per-click. It could end up being that you want to go face to face with a direct sales team. So some products and services are going to be more suited to different mediums and it’s going to come down to who your target market is. If your target market are large organizations or groups of people, then you may need to go and attend those meetings. If it’s individuals who browse their computer from home, you may be able to reach them very easily via Facebook. So totally different channels, but being clear on who could potentially get the value, whose problem does it solve, and why is it so interesting to them might give you some clues as to where you can find them. Well let’s move on to the next scenario. This scenario, we come up against one of my favorite topics, which is selling. It’s amazing how many people are out there with goods and services who every day, will have their income predominantly determined by their ability to translate their message and to understand that they are actually in a sales process. So it was worth sort of breaking down some of the steps. Firstly, I guess, we should start with the definition. My favorite definition about selling is that it’s the process of change from one situation to a better alternative situation. This really helped me understand stelling because it meant that everything that I was doing was to help the customer be better off and I could feel really good about that. Steve: Yeah that’s right. I think a lot of people struggle with selling; I know I did initially. If you feel like you might be taking advantage of customers or something like that and it’s hard to get that out of your head. That’s my favorite definition as well because it really helped me to go, well actually that’s true. When I sell something to somebody, it does help them, and I think it was good. But what was great about this scenario for me and for everybody sitting in the room, you’ve just got so many years of sales experience to draw on and you took us through a process and sort of a whole flow of how sales works that just was eye opening. I think you should share it with everybody. James: Yeah. So the framework that I used for many years and taught a lot of salespeople to follow is based around the spin selling technique, and I know I can get all techie in it, but it’s really quite simple when you think about it. The first phase is the opening phase and the whole point of that is really just to establish enough communication to be able to investigate or to ask questions. I want to point out, we’re talking more about high level sales here, high value sales, solution-based selling. So it’s not so much about putting petrol in your car or buying Mars bar at the supermarket. We’re talking about something that’s expensive. To sell something expensive, to help someone be better off, it really helps to find out a little bit about what they’ve already got and to just probe into areas of what do they like about what they’ve got now, what they don’t like about what they’ve got now, and that helps you identify problems. So this investigation is really where most of the selling heavy lifting is done. By encouraging people to tell you more about their current situation, you get a lot of facts and a lot of things that can help you guess as to where you might be heading in the conversation, and that sort of helps you develop the implications. So a lot of rookie sales people will rush straight in and solve the problem but they don’t develop it enough. I taught a very simple equation, perhaps you might remember that one, about the size of the problem. Steve: Yeah, that’s right. By the way, I’m one of those techies who can’t help themselves. Somebody says, “I’ve got this problem,” and I jump, “Oh, I know how to solve that.” I thought this was particularly good. But it’s only by helping people to understand the size of the problem that they have so that it is equivalent to the value that you’re asking for that they’re going to be able to make a decision. What tends to happen in a sales situation if you do just go from the situation, you know the problem and you jump straight to the solution, you haven’t given them enough time to dwell on the problem and people immerse themselves in that scene and they just go, “Oh, actually it’s not so bad.” And they stay where they are and you don’t have to help them. James: They don’t see the full magnitude of the problem. So the solution doesn’t have to be that expensive. Therefore, they’re probably going to be asking about price and discount. But if they have a full understanding of their problems and what that problem means, we actually have to expand the problem. We’ve got to continue on and even better, we get the customer to tell us why this is such a bad thing. That’s the really magic part. If you can have the customer telling you why their problems are so bad, then everyone knows that the solution is obvious and it’s fait accompli, it’s required, it’s necessary. So then you can start talking about solutions. I’d also give you a little tip about solutions, which is quite handy, and you picked it up Steve. I’m not sure if everyone did, but it was quite a subtle difference. Steve: Well, what you mean is you also got the customer to tell you what the implication of solving the problem would be. So not just helping to focus on how bad the recurring problem is but how wonderful it will be when that problem is solved. What would it mean to you if that was solved? James: Exactly. So now the customer, and we role played this by the way, if you’re trying to understand what we’re talking about. The customer is telling you how your solution will be helping them so much, then it really is quite easy to move to the next stage, which is just to demonstrate capability. That is also known as proof, or risk reverse, or just showing some confidence, other jobs you may have done, other things you’ve sold, your track record, why they can trust you, and then you just move to the most appropriate close. Now if you’re dealing with the decision maker, that might be the order. If you’re not dealing with the decision maker, you may need to ask for the appointment with the decision maker. That might be the most appropriate close to the situation there. Steve: I did like the way that you transitioned your close. You went through a couple of different examples. There was one where you asked a question. You want to share that one with the people listening? And that’s basically saying, look, ask your questions and we’re pretty much at the end. That’s where we’re at. So that was a fun sessions and it gave some good understanding on the sales process. Steve: And then we moved into, what can we do to make that even easier, which is of course having authority in the marketplace. James: Exactly. If you have people coming to you because you’re the expert, it goes without saying that you can have high conversion ratios, you have less selling to do and more diagnosis and really just working out what the solution is. You don’t have to convince someone to go ahead but they’re already convinced they want to deal with you, you’re the right person, they’ve been told by three other people, they saw you somewhere or they heard about you. So let’s just talk maybe two or three things that you could do to increase your authority. Do you remember what they are, Steve? Steve: Yeah well, you could for example do a podcast apparently. That can help. You could write a book. That used to be pretty hard. Amazon might have been a little easier now because so many books are on on digital. You might have even said something about that on this website. You can publish a Kindle book. So it’s another way that you could do it. And of course speaking. Speaking is a big thing. You could speak at an event. You could run an event. So these are some of the ways that we talked about. All of which put you in the position of being the obvious expert. James: Exactly. And a couple of my favorite ones are, if you’re not ready to speak at an event or run an event, you could certainly attend events because just having attendance at events will start to build that familiarity people they see you at events. When I go to the United States, a lot of my friends there, they know who I am, they know what I do because they see me there quite a lot. I put in the effort. I went over there many, many times to different events. One of my other favorite things is to do interviews and to provide content for other people in their community. That way, they are putting me in front of their community as a guest or an interview person and I’m speaking about things that I’m passionate about and interested about, and competent with, and that’s important. You need to be reasonably competent with it, and they’ll be introduced to you by their leader or their community authority as someone that they should trust and should listen to and that actually expands your circle of influence and increases your authority asset if you want. It’s very hard to measure authority but you can get an indication when you look at repeat purchase rates and when you put out new products, how hard you have to push for people to actually pay attention to it. OK Steve O, let’s shift gears now. We’re just going to talk about the people side of the business. Now, I imagine a lot of my listeners are sole operators or very small businesses, maybe micro-businesses. And that’s fine. It’s certainly how I started part-time when I was doing a full-time job. I wanted to get this Internet marketing thing happening. Eventually, I found people to help me on that mission. They started as part time and as the business grew, I just got to the point where I couldn’t really take it to the next phase without bringing in full-time people. So I started acquiring full-time employees a couple of years ago, and I’ve got quite a few onboard now. Now if any of the listeners are actually in that process of scaling up, we’d call it growth, then this will be of interest. Some of the very common topics that we get in the masterminds are, how do I grow my team from one or two people up to five or six? Seems to be that you get a real, critical mass difference when you have five or six staff versus the first one or having just a part time team. You’re also very close to that. Steve: I’m close to that number and you know, struggling a little with some of those issues. It’s one or two people at a time on the call, it’s easy to manage. And when you got four people on the call and you’re trying to get through all the stuff, you can spend the whole day just talking to people. James: I think the bottleneck for a lot of business owners, and entrepreneurs, and Internet marketers who are really trying to step it up, and what we’re talking about here is we’re talking about going from the tens of thousands to the hundreds of thousands. I really think that a team of five or six is going to get you into the several hundreds of thousands and potentially up to the 7-figure mark. Certainly, you’re probably going to want more people if you’re in any sort of service provision role. A lot of people have figured out that service provision is a double-edged sword. It’s a high-demand thing because people want things done for them and it’s also really difficult to hire, to find, to manage and lead people. So perhaps Steve, you could tell me a couple of things that we discussed that you thought were interesting as an operator of a small team of five or six people. What could someone expect or what could they pick up now that would save them a year or two of trying to figure out themselves? Steve: Look I think the really key thing for me that comes across in the way that you manage your team and in what we discussed yesterday was empowering the people in your team to make decisions. So you’re set up now, as you said, you can go overseas, go to conferences and things like that, but you can be off the grid from the perspective of your team for days and even weeks at a time. Your team is so good at doing the “what would James do?” question when they’re trying to solve a problem. You’ve allowed them to make those decisions. The attitude that you take into that is very much one of, “you won’t necessarily get it right but you’re not going to be in trouble for making a decision, and here’s the criteria: what’s best for the business without being greedy? What’s best for the customer? That’s it. And what would James do? That was the story, the magic question. I just thought that was fantastic. Implementing is tricky. I think a lot of people underestimate how hard it is to build and manage your team. But it is vital to grow a business. It’s the key skill. James: Yeah. You know, if you’re not hiring a small team or using a dedicated special service provision from someone else’s team, then you’re probably only going to get to a certain point until you have to. So just start thinking about it. And also I prefer the team leadership role rather than the team management. I think you have to be a leader. If you want to have a successful business on the Internet, then chances are you’re probably going to have remote staff at some point, people in another place other than you. So if you want them to understand what you’re about, if you want them to help you grow your business and be happy about it, then it’s good to improve your communication ability and that’s what being a good leader is about. Communicating what you’re trying in the most effective way possible and to get the results and everyone’s happy about it. Steve: I think too, you’ve also got a really solid set of cool values that the team have, they’ve born into that because they’re good values. James: Well because they created them actually. Steve: Oh, I love it. James: So that’s the thing. I don’t set the core values. The team does. That’s where we sit down and talk about who we are. What does it mean when you’re part of our business. SuperFastBusiness is our business name, but it’s not just me. I’m not SuperFastBusiness. It’s all of us. What sort of people would we like to hire? How would we like to be judged as whether we’re doing a good job or not? And how we’d we know if someone’s not performing in accordance with the way that we think the company should be operating? That would make it clear that they don’t belong. Luckily, we’ve hired very well according to the values so we tend to keep people, which is cool. Last session, that was really interesting because we’re dealing with a new concept, a new way of I guess speeding things up or automating processes that could be highly manual and expensive. You get the same set of questions every time this scenario happens. How much do I charge for it? Who do I sell this to? Like what question should I even be asking? I mean the product creator or the inventor so to speak had these issues and put it out again to a small like-minded group to get ideas. What do you think some of the insights were in this situation Steve? Steve: I think that, again very similar to the first scenario, there was a lot of light bulb moments of just how much bigger this could be in terms of the size of market or the types of market that it could serve. James: But how do you identify who it could serve? What’s the process? We’ve done it twice in a day. What sort of things, is there a set of questions you think got that response? Steve: Yes, very much so. Who would use it? What does it do? Why would somebody use it? And just in answering those questions, just that list of all the things that it could be used to serve came out. And also, the other question in that particular session was going about naming something. That was interesting as well because until you’ve got clear what it can do, and who it can serve, and what words would they be using, then it really helps to come up with some names. So that was fun as well, the name brainstorming session. James: There’s a lot of names training out there, but I think there was one in particular where the product creator was extremely keen, like registered instantly. It obviously struck a cord. It ticked the box, and that’s when you get the connection. Like that’s what it is. I do like to name products early. Well and truly early. And then as I’m developing that product in my notes and building up the slide decks and the videos for it, it really helps me think about what it is. But it absolutely is important to know who you’re talking to. With some of these concepts that were quite broad, we’re talking to several groups, so you just list out the groups and then you can segment it. You could have different websites or even different pages on that website to serve each of the groups. So I thought that was a really useful session. I guess in summary, the main thing we ended up with from the workshop, which I was pleased about, was that we were able to have some action items to walk away with, to actually strain these ideas and concepts into some actions. So I’m really hoping that our listeners have made a couple of notes or had a few a-ha moments, and I encourage our listeners to go and implement. Action the items that you’ve written down as a result of this podcast, and leave your comments on iTunes. That would be really cool. Any closing comments, Steve O? Steve: The taking action after the event, I’ve seen you at events taking notes, you don’t write down what people are saying. You write down what are you going to do because of what you’ve heard. And that’s such a key difference. So yeah, definitely, there are some gems in this podcast that you probably need to action in your business. Like James, I would encourage you to write them down, put them in a to-do list and tick them off. James: In this podcast, one of my action items was to just summarize the day in a short form just to recap for myself what we covered, so I can be really clear on what problems we’re solving, whose problems we’re solving, and how we could potentially help other people. So thanks for coming along Steve O. I hope to see you at the next Intensive. Steve: Me, too. Thanks mate! I hope you enjoyed this episode, please comment below or share with your friends, or head over to iTunes to rate it.